FLIR Systems, Inc. has released a new line of thermal imagers that are affordable (by thermal imaging standards). The PS-series is initially aimed toward the civilian hunting market, but will branch into the law enforcement and maritime markets this year. 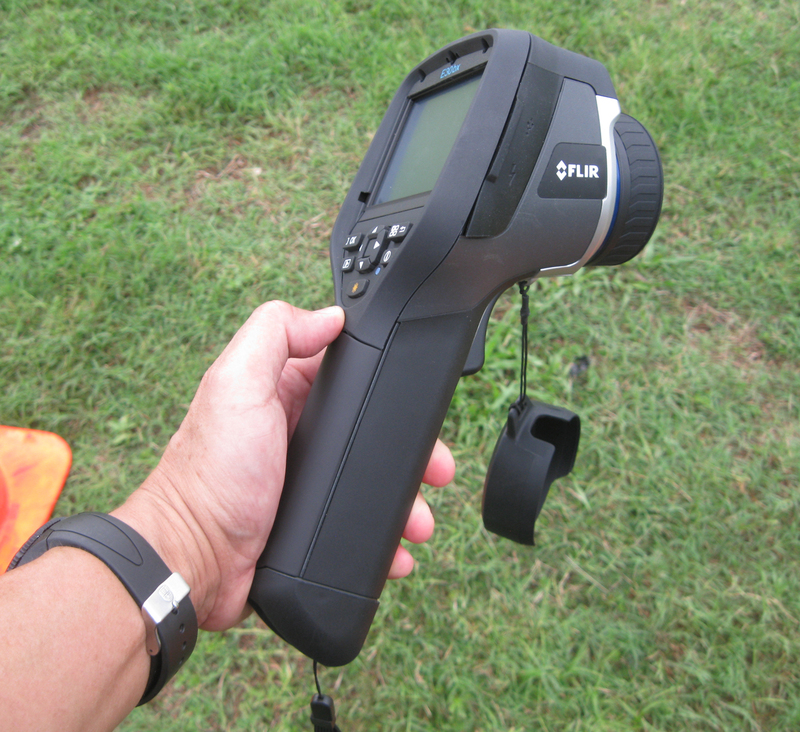 The E-series is an industrial use thermal imager with police applications. Starting prices for the units are $1,999.00 for the PS-series and $2,500.00 for the E-series. I stopped at the FLIR booth at the 2012 SHOT Show and checked out one of their Scout PS24 imagers. This model is an entry level device, but it has terrific tactical potential. The PS24 has a color LCD viewfinder display that can be toggled through White Hot, Black Hot, and multiple Red/White Hot palettes. The unit makes a very effective general search tool. There is no magnification enhancement on this model, which is just right for area checking because it has a wide field of view of 24′ x 18′. FLIR touts the thermal detection range for the PS24 at 320 meters for a man-sized target of 1.8m x 0.5m. 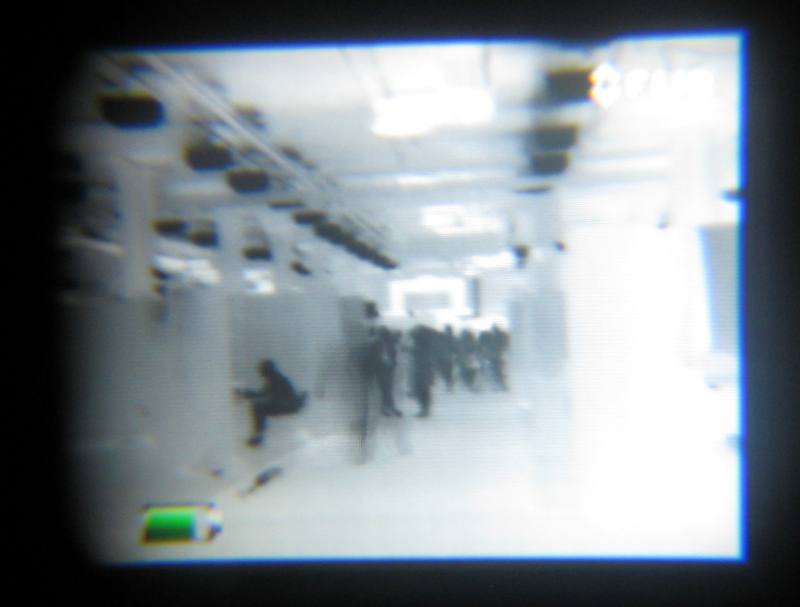 I took a few photos through the PS24 around the show floor. The images were much clearer to the naked eye. It is interesting to note that had they been taken in pitch darkness, the imagery would be exactly the same. Ruggedized and weather-tight, the FLIR Scout housing has a grippy exterior feel. The unit runs on a rechargeable lithium-ion battery. FLIR South American Representative Marco Goes told me the battery has a 5+ hour life under continuous use on a single charge. A PS24 weighs 12 ounces. It has a USB port to connect the unit for software upgrades. When I was visiting St. Petersburg Police Department a few months ago, one of their sergeants showed me his freshly issued Deadstop ballistic shield and a FLIR E30bx thermal imaging camera. Both items were issued to about 50 of their supervisors. 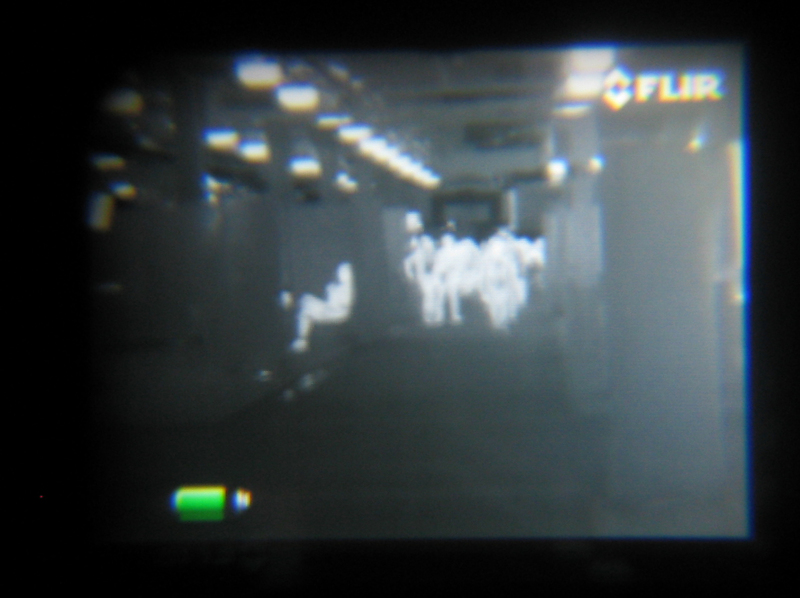 The E30bx is not an LE-specific model from FLIR, but it has excellent potential for street use. With a 3.5 ” touch screen LED display, full color thermal sensitivity, and a handheld pistol grip design, this unit is slightly different than the monocular style of the PS series. I monkeyed with the E30bx and can see why St. Pete bought them. As a dedicated tool, meant for a critical incident, it would be extremely helpful in outdoor and slow and methodical indoor searching. I think the smaller PS24 would ride well in a pouch on a SWAT officer’s outer vest. 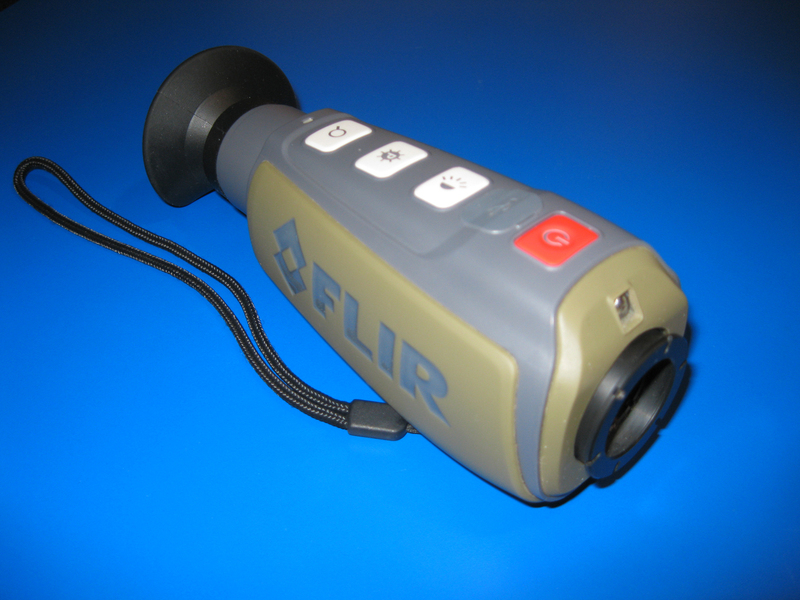 While FLIR has an H-series specifically made for law enforcement use, the initial buy-in is around $5,000.00 per unit. Giving similar imaging performance, I think these two types of FLIR can easily provide adequate service to officers searching for suspects in low and no-light conditions at a better price point. This entry was posted in Street, Technology, Uncategorized and tagged FLIR, FLIR Police, Thermal Image Searching, Thermal Imagers for Law Enforcement. Bookmark the permalink.